Alright, so we’ve got a tuk-tuk for 60 Rupees right bro? 60 rupees. Because we didn’t we kind of picked the wrong spot to get dropped off at. Yeah and now we’re going to see the Buddha statue here on Sagar Lake. The Buddha statue is a humongous statue in the middle of the lake and the only way to get there is through Lumpini Park and get a ferry from there. The boarding time is between 2 and 8 P.M.
We’re getting 20 peanuts here from this guy who has setup his street food stall right on it is like a bicycle stand. You can see the fire and then he is just like his spatula and he’s moving them around and he’s putting them into like it is like a newspaper. The locals here in this city have been the friendliest of any city I’ve ever visited in India to date. The street food tour continues. We’ve got two different items. 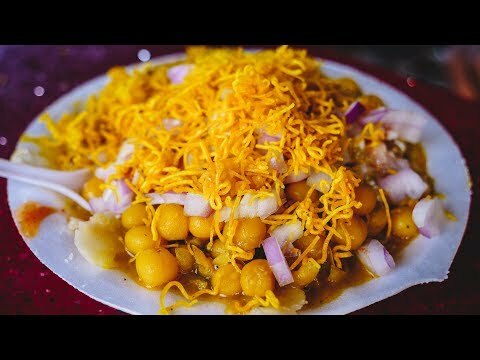 We’ve got Papdi chaat over here and samosa chaat. We have chickpeas, onions and sev. We’re getting Kulfi Indian ice cream to cool down. We’ll see you with more India travel and food content soon. Ciao guys. Peace.